This green leafy vegetable has to be one of my all-time favorites for a number of good reasons. If you've never tried growing it, there's no time like the present. It's perfect for spring planting, amazingly easy to grow, and very resilient. To use a popular idiom, Swiss chard rocks. For non-American readers, that means it's something that is amazingly good. 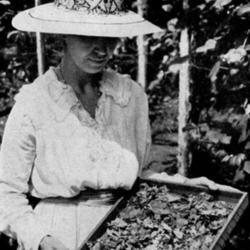 Of course, many non-American readers will already know this since chard has been popular in many cultures for centuries. 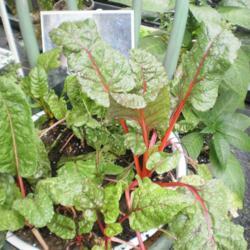 The "Swiss" part of the name was added by seed catalog publishers in the 19th century to distinguish chard (Beta vulgaris subsp. cicla) from French spinach varieties. 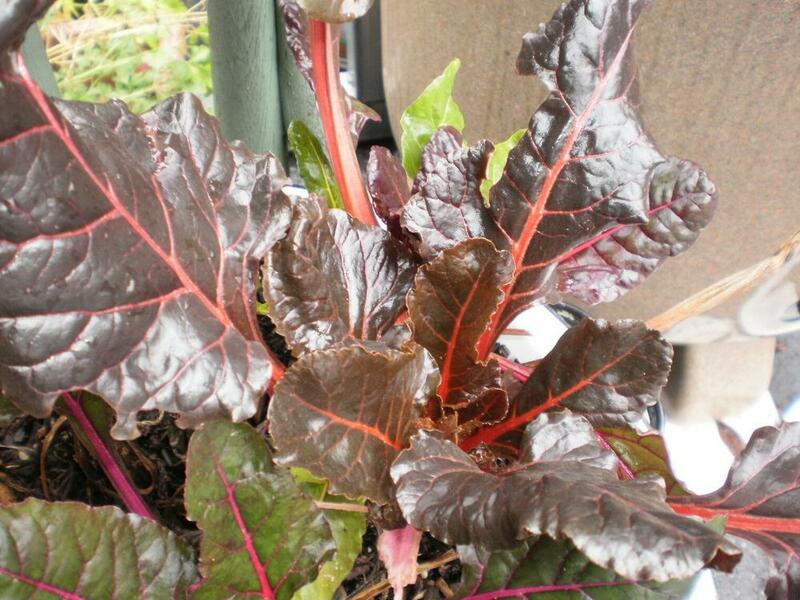 Swiss chard is in the same botanical family --Amaranthaceae-- and subgroup as beetroot (garden beets). 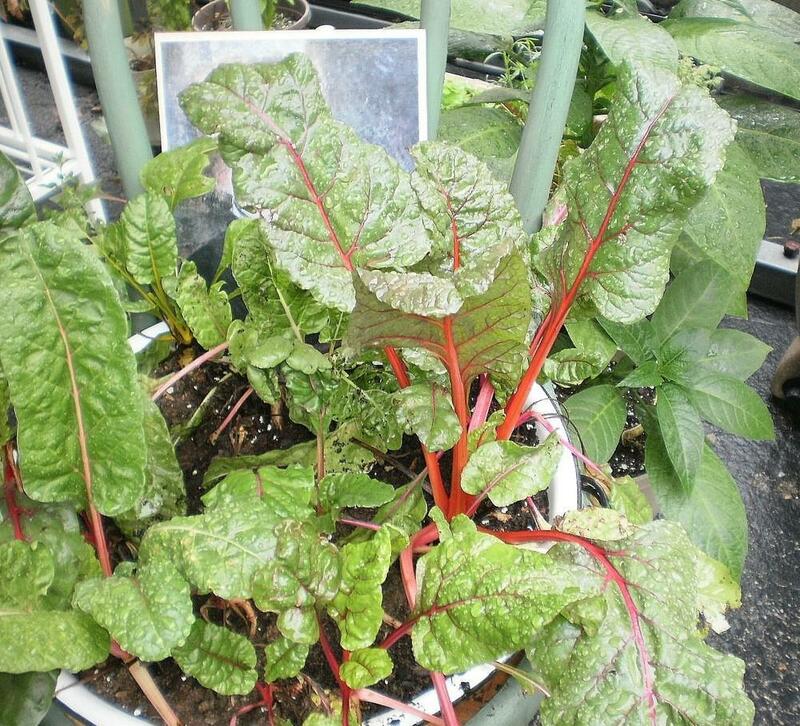 Chard's many common names include spinach beet, silverbeet, crab beet, perpetual spinach, bright lights, seakale beet and mangold. It has been bred and cultivated for the large leaves while its close cousin, the garden beet, is primarily cultivated for the root, although beet greens can certainly be harvested and eaten as well. I don't know about you, but I am very fond of plants that are tough and easy to grow. Swiss chard is both. Swiss chard is a semi-hardy, cool season vegetable* that should be planted to mature in spring, early summer, fall and winter. 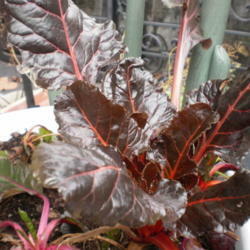 In the ground, chard should be sown directly into the garden in early-to-mid spring. It can be planted about two weeks before the average date of last frost. Plant the seeds ½ to ¾ inches deep at 8 to 10 seeds/foot of row. Rows should be 15-18 inches apart. Thin seedlings to 4-6 inches apart. An alternative method is to thin the seedlings to about 3 inches apart and then harvest some of the whole plants when they are big enough for eating (6-8 inches tall). Leave the final spacing for the remaining plants at 9-12 inches apart. Maintain sufficient soil moisture to keep plants growing well. 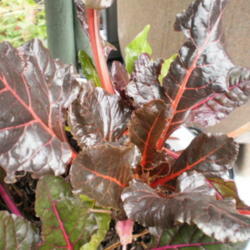 Another great thing about Swiss chard is while it grows well in full sun, it will also tolerate some shade. Therefore, it can be tucked into the garden or yard anywhere there is room ... even in places such as a partly sunny perennial border. 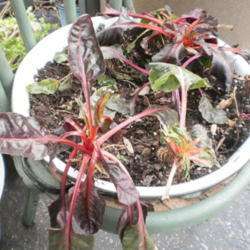 Make use of whatever space you have available to plant your chard. 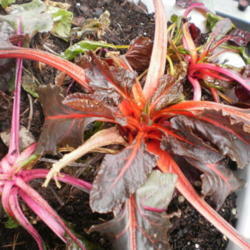 The stalks and leaves of Swiss chard are showy and attractive enough to be grown just about anywhere among perennials. mixed colors -- Rainbow (which is not a variety itself but a mix of varieties), Bright Lights, and Neon Lights. When they are young and tender, cut off the outer leaves only at about two inches above the ground. Take care not to damage the terminal bud at the bottom center of the plant. Chard can also be harvested after the leaves are larger and more mature but will have slightly tougher ribs. Swiss chard is quite perishable; if it is not going to be eaten immediately, store it (unwashed) in a plastic bag or container in the crisper bin of the refrigerator. It will need to be used within three days. Stalks can be stored longer if they are separated from the leaves. 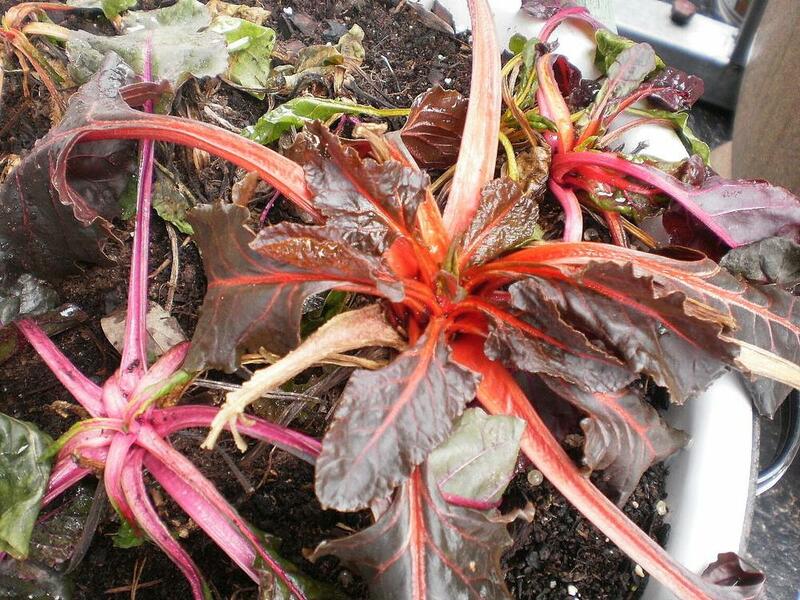 Besides freezing, a frequently overlooked method of preserving chard is drying the leaves. To dehydrate your chard, tear the leaves away from the stems (save the discarded stems to flavor soups and broths), wash, and then blanch the leaves by plunging them into a pot of boiling water for a few minutes or until they are just barely limp. Remove from the pot and quickly place under cold running water or submerge them in an ice bath to stop any further cooking. Spread the blanched leaves onto trays and dry in a dehydrator or oven at 150º F until crispy. You can also dry them on screens outdoors to save electricity. If you choose that method, don't use galvanized screens which are treated with zinc and cadmium and can cause a harmful reaction when in contact with acid foods. Same thing applies to aluminum screening. Outdoor drying trays can be lined with cheesecloth, if desired. Store the dried leaves in airtight jars or moisture-proof storage bags out of direct light. The dried chard can be rehydrated and added to recipes. 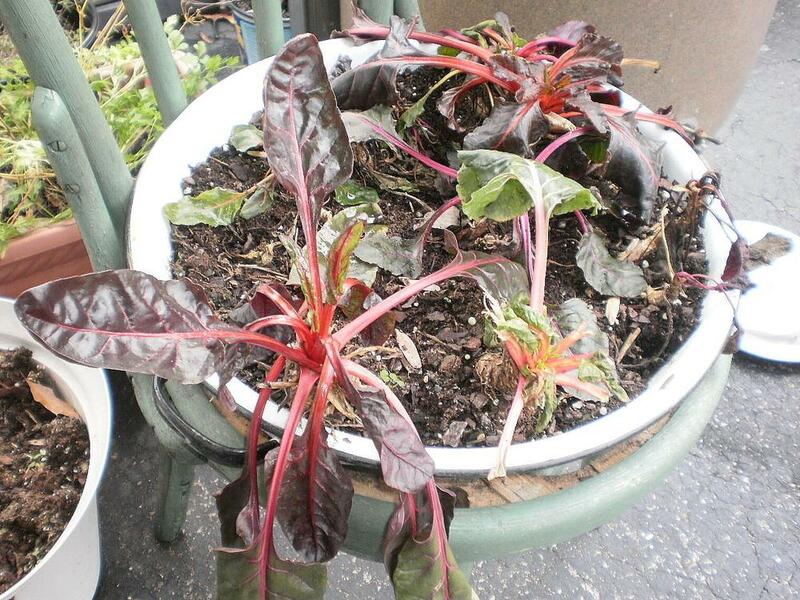 Swiss chard is also terrific in containers. 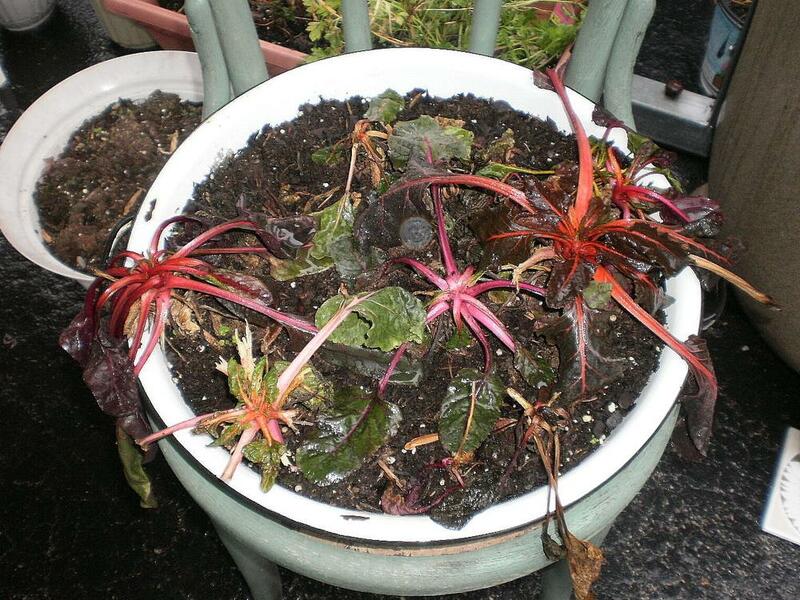 I am a big fan of container gardening, and I can't praise the hardiness and resilience of chard for that purpose highly enough. The 'Bright Lights' Swiss chard shown below withstood nighttime temperatures in the teens and daytime temperatures well below freezing. It will droop down completely flat and look like a goner. In a few days, new shoots are visible at the terminal buds in the center of the plants; in a few more days, some of the original large leaves are back up and standing strong. 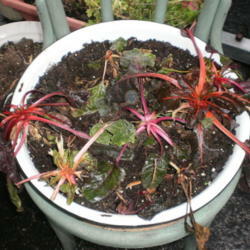 This chard was grown from seed sowed directly into an old repurposed enamel dishpan. Keep in mind that the soil in the pan is a little less than six inches deep. These particular plants have withstood night temperatures as low as 16º with daytime temperatures below freezing on some days, and they are still growing and producing. That's how amazingly resilient and wonderful Swiss chard is. In fact, some say the taste is greatly improved in cold weather after a good hard frost. 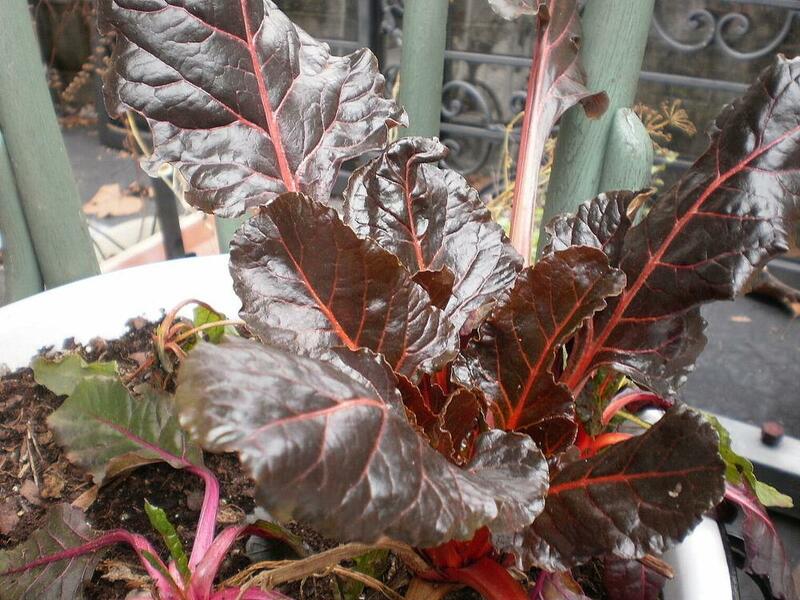 If you've never grown Swiss chard, maybe you'll want to plant some this spring ... and find out for yourself. Cooking Swiss chard is even easier than growing it. One current food trend touts adding bacon or bacon fat to just about everything. I like a little bacon, but it is a strong flavor that sometimes covers up other flavors. That's not necessarily a bad thing if you dislike greens and won't eat them without something to mask the taste. But in the South, greens and vinegar are renowned as a perfect stand-alone flavor profile -- nothing added, no ups, no extras. They can hold their own against any other vegetable on the table. To cook Swiss chard, simply steam it along with some fresh garlic, if desired, to the tenderness you prefer. Then add a little balsamic, cider, or red wine vinegar. Voilà. So easy, and the dish has a nutritional profile that is second to few other foods. Salt, pepper, spices and other things can be added, of course, but I can't vouch for such non-traditional concoctions. Sautéing Swiss chard in a little olive oil is another easy and healthy way to prepare it. Granted, it probably won't be the prettiest dish you ever prepare, but it will be among the most nutritious. The slightly bitter taste of raw chard will disappear when it is cooked. And as with other leafy greens, there is a lot of 'shrinkage' when cooking Swiss chard. A raw bunch may appear large, but when cooked, the resulting volume will be considerably smaller. 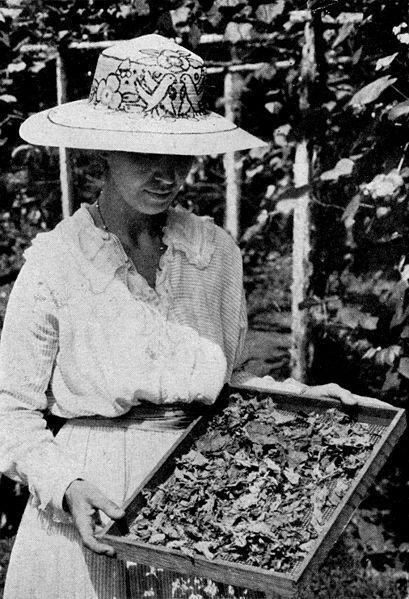 Six cups of raw greens will yield approximately one to two cups of cooked greens. The large raw leaves of chard are suitable for wrapping fish that will be steamed, as well as for using in salads and as sandwich wraps. The latter is a good bread substitute for gluten-free diets. If there is any downside to Swiss chard, it might be the higher levels of oxalic acid it contains. Oxalic acid is the thing that makes your teeth and tongue feel "fuzzy" or your throat burn after you eat greens like chard or spinach. That funny feeling is caused by the oxalic acid crystals in the greens binding with the calcium in your teeth and usually passes fairly quickly. Because of its affinity for binding with calcium, high levels of oxalic acid in the body can disrupt calcium absorption and may cause kidney stones in sensitive individuals. Boiling chard is said to help reduce the level of oxalic acid in it. But that debate rages on. I can honestly say that if I were ever restricted to growing just a few vegetables, Swiss chard would be right at the top of my list. It's that amazing. *Cool season vegetables are those that need cool soil and cool air temperatures to germinate or to grow and mature with maximum quality and yield. Many are fairly shallow-rooted and sensitive to drought.